The ad industry’s ratings watchdog -- the Media Rating Council -- has moved from simple quants to the most sensitive qualitative area, issuing official guidelines for content and brand safety. The official guidelines, dubbed “Supplemental Guidance on the Content Level Context and Brand Safety Ad Verification,” were issued as a preliminary draft earlier this summer with a request for industry stakeholders to make public comments. 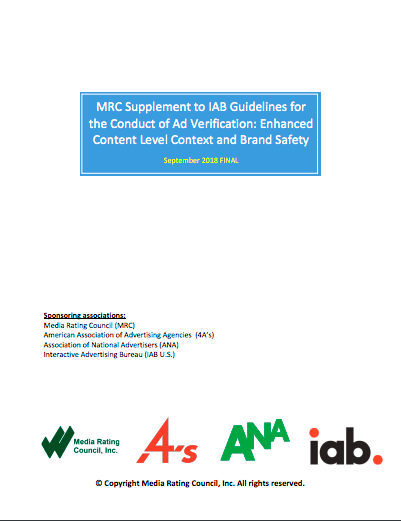 The MRC says the final release enables “services and platforms” to apply to the MRC to accredit their own content-level brand safety ad verification processes. The guidelines were developed in conjunction with the American Association of Advertising Agencies, the Association of National Advertisers, and the Interactive Advertising Bureau, and outline specific requirements for an ad’s proximity in relation to discrete pieces of content.